Hi, I am interested in your 1965 Ford Mustang (stock #1198-NSH) listed on Autotrader for $35,995. I'd like to get more information about this vehicle and confirm its availability. Candy Apple Red has got to be the best name ever for a car color. Any car painted that color has got to be fun, right? On top of that, when Ford designed the original Mustang, they created a compact, sporty American car that was fun to drive. It literally started the Pony car movement. So, how much fun do you think you can have with a Candy Apple Red Mustang? Come on down, check this car out, and see for yourself. Fastback styling wasnt that common at the time the Mustang was introduced, but the style has proven popular through time, and looks better today than ever. The new ones have even returned to the look. And while technology and aerodynamics are nice, the crisp clean lines of this original are what make it so iconic. The long hood reaches on out over that classic grill with the galloping Mustang in the center underlined by a pencil thin chrome bumper. The top edge of the front fenders echo the ridges in the hood as they head back in a straight line until it meets the rear fenders. There it turns up creating a muscular fender bulge as it meets the vents in the fastback roofline. 289 as well as Mustang 2+2 badges appear on the front fenders while out back, the fender line turns down to meet another sharp looking chrome bumper that frames another styling cue that has stood the test of time, the triple Mustang taillights. Open the door and you will find a super clean Black interior that recalls a simpler time. The door panel sets the pattern and tone with smooth outer edges stepping in toward a vertically pleated center outlined with thin chrome piping, with a chrome window crank and door handle. The bucket seats follow suit with pleated seating surfaces with smooth bolsters, and chrome framework for the folding back. A black steering wheel has a three spoke chrome horn button with a galloping Mustang over red, white and blue stripes in the center. Behind it is a simple and clean dash with a horizontal speedometer flanked by round gauge pods on each end, with all of it dressed up in thin chrome edging. The ignition key and control knobs are mounted along the bottom and a custom center console holds a Pioneer AM/FM/CD player as well as a tachometer and auxiliary gauges for oil pressure and charging voltage. A T-handle shifter rises from the floor and vinyl Mustang floor mats protect the nice fresh carpeting. Pop the hood and you will find one of those very desirable 289 cubic inch V8 motors nestled down in a neat and clean engine bay. There is a chrome air topper with a 289 High Performance decal sitting on top of a 4-barrel carburetor feeding the engine through a stock intake and heads. Gold valve covers look good and signs of good regular maintenance include new spark plug wires as well as belts and hoses. A 3-speed automatic transmission gets the power to the rear wheels, while up front the power steering system received new lines as well as fresh shocks. All that and a beefy sway bar help the car handle like the sports car it is. Front disc brakes provide good stopping power and the rubber meets the road through 205/60R15s in the front and 225/60R15s in the back mounted on Magnum 500 wheels. 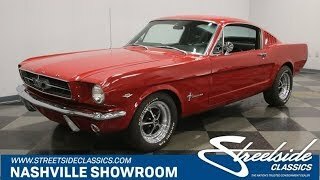 It doesnt get much more fun than a 65 Mustang V8 in Candy Apple Red. Come on down and see for yourself.